We, women’s groups, students’ groups, health groups, democratic rights’ groups, civil society organizations and concerned individuals express our deep distress at the recent political developments in Burma. 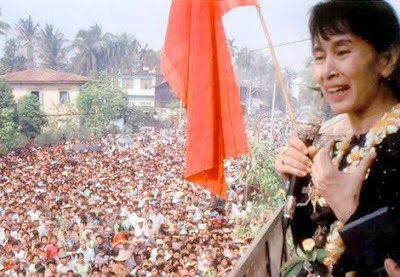 On 14 May 2009, Nobel Laureate Daw Aung San Suu Kyi, 63, who has been under house arrest for 13 of the past 19 yearswas transferred to the notorious Insein Jail in Rangoon by the Burmese military junta, State Peace and Development Council (SDPC) and is being ttried at special court on trumped-up charges of violating the terms of her house arrest. Her current six-year term under house arrest was to come to an end on 27 May, 2009. UNITED NATIONS — The route out of the financial crisis — at least in the view of Miguel d’Escoto Brockmann, a ranking Sandinista and the fractious president of the United Nations General Assembly — should be lined with all manner of new global institutions, authorities and advisory boards. How many? Nine, to be exact and they are (take a deep breath) the Global Stimulus Fund, the Global Public Goods Authority, the Global Tax Authority, the Global Financial Products Safety Commission, the Global Financial Regulatory Authority, the Global Competition Authority, the Global Council of Financial and Economic Advisers, the Global Economic Coordination Council, and the World Monetary Board. Upcoming UN General Assembly's International Conference on the Global Economic and Financial Crisis and its Impact on Development is planned to address the current situation which is constitutes a “ticking time bomb”. The UN is convening a three-day summit of "world leaders" from June 1-3, 2009 at its New York headquarters "to assess the worst global economic downturn since the Great Depression." Unified Communist Party of Nepal-Maoist (UCPN-M)leader and Nepal’s Prime Minister Pushpa Kamal Dahal (Prachanda) announced his resignation on May 4, 2009 after President Ram Baran Yadav of Nepalese Congress party reinstated the army chief Rookmangud Katwal who sacked by him. Nepal's Supreme Court on May 14 issued a show-cause notice to the government on its decision to sack Army Chief Rukmangad Katawal for allegedly defying its orders. A single bench of Justice Bharatraj Upreti issued the order on a writ filed by an advocate demanding to scrap the government's decision to sack Katawal and asked it to reply within 15 days. On May 13, a writ was filed in the court arguing how the decision of Council of Ministers (on May 4) to relieve Katawal from the Army Chief position and appointing Lt. General Kul Bahadur Khadka as the Acting Army Chief was unconstitutional.